if you would have anyone doing your courses or recently completed either who is looking for experience. Ideal candidate would be flexible to work in a busy retail environment, hours would vary over a seven day week & include some late evening openings. Qualified, experienced florist required for busy County Cork florist. The position is part-time with an eye toward a full-time if desired. 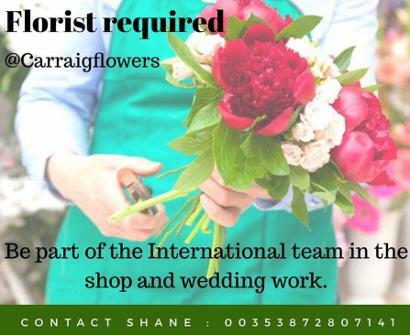 Please direct CVs to westcorkflorist@gmail.com by 1 March 2019. A great opportunity to gain experience in the whole sale retail flower business. Van Vliet Ireland Ltd is an importer of fresh cut flowers and pot plants for both wholesale and retail. We have a pack house in Swords close to Dublin Airport where we produce Hand Tied Bouquets floral arrangements and small posy gifts for our busy Mother’s Day period. We currently have a number of positions available starting on the 21st of March until the 29th March this would give a great insight into how the Retail and Wholesale part of the business functions and at the same time get paid!! This would greatly benefit people seeking a career in the flower business. Full training will be provided and no experience required if interested please phone or email Mondays Wednesdays and Fridays and ask for Mary or John look forward to hearing for you. Ferguson Flowers, seek a florist to join their team on Holywood's High St. The ideal candidate will have a some experience in a retail environment, and also have previous experience or basic training as a florist. But don’t worry, we’ll teach you all you need to know. The position requires the candidate to assist existing staff in a busy florist shop including conditioning flowers, assisting customers, answering phones, shop displays and creating bouquets. The most important attribute will be to be good humoured and up for a bit of fun and some hard work. The position is Full-time and Salary will be dependent on experience. A flair for all things Floral, and a passion to learn new and exciting things. Infinity Flowers. Navan Shopping Centre (we beside Keyes and heels bar). We are looking for an experienced florist to join our busy shop based in the West of Ireland. We need a very creative person to make beautiful floral designs for all occasions, corporate, weddings, gifts, funerals. We are looking for someone with a bubbly personality and can relate well with people - high customer service is a must!! We need you to have good telephone manner and be able to aid clients when choosing and placing their orders. Shop display and presentation is also part of our everyday routine and all staff are involved with this. We have a busy shop full of gorgeous seasonal and Irish flowers and foliage sourced daily and an amazing selection of both indoor and outdoor plants. We would love to see examples of your work and maybe a picture of you along with cv and references so that we can make sure we have the right applicants for interview. A full clean drivers license is required. The salary will be based upon experience and skill. FAB FLOWERS in Cork requires a full time florist. Based in Cork between Douglas & Carrigaline. Florist vacancy for busy flower shop in Gorey town. Experience would be an advantage but not essential as training will be given . Young energetic people person. Recruiting for position of an Experienced Senior Florist. This is a part time position for at least 1 day per week with extra work to cover holidays, events & weddings. GREAT OPPORTUNITY!!! WE ARE HIRING!! We are looking for dynamic individual with outstanding customer service and great communication skills. The position will provide an exciting opportunity for progression within Kildare’s high profile venues. enthusiastic and have a passion for the Industry. you must be able to work on own initiative and cope well under pressure. The successful candidate must have a minimum of 3 years floristry experience and be able to work in a fast paced environment using their initiative without the need of supervision. Excellent experience in all areas of floristry especially bouquet preparation and presentation, all types of arrangements, excellent spoken and written English, Good attention to detail and customer service, pose a good flair for trends, colours and creativity. Social Media experience will be an advantage. This is initially a seasonal role and you must be willing to work long hours which will be flexible in a naturally cold environment prior to Christmas. It is a challenging, demanding but fun time for all involved in our quirky and creative business. For the right candidate we are willing to look at extending the employment during other busy times ie: Valentines, Mother's Day and possibly a long term part time role. Part time florist required in the West Cork area,suitable applicant must have previous floristry experience hours and days will vary each week and applicant must hold a full Irish driving licence, we look forward to inviting a new member to our team. Part time florist required on a 3 day week basis near Kildare Town. Experience in bridal party work essential as that is predominantly the main line of work. Applicants must be offay with making all styles of bridal bouquets, altar arrangements, pedestal arrangements, presentation bouquets and the like. Own transport and full clean drivers licence required for this job. Exciting Opportunity to join our team at Flowers by Moira Dunshaughlin. We are looking for an experienced and enthusiastic florist with a passion for all things floral to join us. We have a busy retail shop in a small village however work on a large number of beautiful weddings all over the Leinster region. We also create and design for many exciting events. May suit full or part time position. Excellent phone and computer skills an advantage. Flexibility a must. We are a wedding florist predominantly, based in Ennis Co. Clare we do however look after all aspects of floristry i.e. funerals, events and occasion bouquets/arrangements. It is a small business that is growing and requires someone who can give that personal touch to our customers. We require a florist who has at least 2 years experience in all aspects of floristry. We would love the chosen candidate to be self motivated, enthusiastic, and not be afraid of unsociable hours. It would be important that the candidate would have social media skills and be able to take orders from our e commerce site. We would love to see this new staff member unleash their artistic talent on our team and look forward to meeting them. Part-time florist with a minimum of 3 years’ experience in a shop environment. You must have excellent customer service skills, be prepared to work within a team environment and on your own initiative. Hours and Days will vary each week. You must hold a full Irish Driving Licence. Part-time Trainee florist, who is eager and very willing to learn all aspects of floristry. Hours and Days will vary each week. Floristry is a very rewarding employment but you must be hard working, enjoy the challenges of learning floristry from the very basic skills of this trade. Please email Cover letter along with your CV, in strict confidence to info@lilybloomflorist.ie, or present yourself in person to our store @ Custom House Quay, Wexford. At Newlands Home and Garden Centre we are looking for team members who are passionate about customer service. We are looking for a Florist to work part-time. The ideal candidate will be assist in creating artistic Flower Arrangements, ensuring that the displays are well stocked, looking after customers and helping to organise incoming and outgoing deliveries. We are a 7 day a week operation and there will be a requirement to work weekends. The ideal candidate will be responsible for providing advice and help to our customers in a friendly and efficient manner. For this role you it would be ideal if you were experienced in Floristry and Sales. A knowledge of the Interflora System would be beneficial. You must have an enthusiastic attitude and a passion for delivering excellent customer service while working with others as a team. You need to be have a passion for floristry and attention to detail. You must be able to multi-task in this busy environment, have a sensible attitude and a friendly approach and a desire to help others. How to Apply: Please email a current CV, cover letter and up to date references to newlandshomegarden@gmail.com. Please only apply if you are willing to work weekends. Experience and references are essential. Wisteria is looking for a freelance florist for our busy periods, Christmas, Valentines, Mothers Day, Holidays, Weddings and events. Lamber de Bie Flowers is looking for an enthusiastic florist to join their team in their Waterford shop. Candidates will be looking after all details of this busy florist shop with lots of wedding clients as well as retail clients. We are currently looking for a florist or junior florist for part-time and holiday cover. If you know of anyone looking for a position please direct them to us. Exciting opportunity for a part time florist. Call 091 776265 or email info@keanesgalway.ie for more details. Keanes Florist, Kilcolgan and Terryland Galway. If you have a flair for floristry and excellent customer service skills, the job offers the opportunity of working within a small team creating bespoke floral designs within a friendly, fast growing business. Although the role will be predominantly shop based creating luxury bouquets and arrangements, and wedding designs there will be opportunities to work on projects including hotel florals, luxury weddings and events. Senior Florist required to work every Saturday . Ideal candidate must have a minimum of 5 years retail floristry experience, , have excellent numeracy and literacy skills, basic computer skills and a good telephone manner . Please send your C.V and cover letter to karen@fleurtatious.ie. We are looking for a talented, conscientious, and hard working florist to join our team of florists. We are a busy, well established, Interflora florists based in Lucan. We are open 7 days a week so working hours can be very flexible. We are looking to hire qualified florists but would also be interested in recruiting talented people with some experience who are enthusiastic about making floristry their career. Part Time Florist Position - Dublin Northside Whitehall rd. PART TIME JOB.. Florist position available at Aideens Florist. Must have a minimum 4 years retail floristry experience. Excellent customer service and excellent English. We would like to employ a young person to train in Floristry at Balla Florists. This position is permanent and full-time where you will work alongside our team of Florists on a daily basis. We will provide the opportunity by giving you further skills to help you become a fantastic asset to our team. We are looking for a trainee who is willing to commit to the business and learn new skills. Must have a clean driving licence, be willing to work flexible hours including weekends and be in good health. You also need good numeracy and literacy skills. You will be trained in basic floristry skills including making bouquets, wedding and funeral work. Due to further expansion in our floral department. We now have a vacancy for a part time floral assistant. Applicants must have minimum one years floral experience. This is a very exciting opportunity for someone who is a flower enthusiast, with lots of variety in this role due to the nature of our business. Applications in writing to info@finesseweddings.ie. The fairy florist in cork is looking for an experienced florist with funeral and wedding experience, 3 full days per week and also do to full time at busy times and holiday relief. FLORIST POSITION available at Celines Flowers & Gifts. Must have minimum of 4 years retail floristry experience, excellent customer manner, excellent customer service and excellent English. Interested in joining our Team here at O'Neill's? We're looking for experienced Florists to join our team both in Willville, Carlingford and in Mulkerns, Cloghogue. Send your CV to info@oneillsflowers.ie for further information! We are hiring! Fleurtatious are looking for a part time florist to join our team. Candidate must be friendly, enthusiastic with fluent written and spoken English. A minimum of 3 years experience is needed. Ita’s Flower World in Roscommon are looking to employ a florist to cover busy periods with a view to a more permanent position. Qualified and experienced florist required for busy Interflora shop to work at busy times and to cover holidays. Approximately one week per month. Applicant should have a minimum of 2 years retail/shop experience. A background in design is desirable but not essential. They must also speak fluent English and have basic computer skills and a good telephone manner. This is a busy shop that caters for weddings, events and corporate work, which will offer the applicant great scope for creativity and variety. This is a great opportunity for the right applicant to join our friendly and creative team. We are based approx 10 minutes bus ride from the city centre beside UCD very accessible. Position also available for trainee florist willing to learn on the job. Floral Art in Greystones is looking for a part time florist (1-2 days/week) If you are interested please contact Floral Art at (01) 201 7271 or via their FB page. Jackie's Florist in The Square Tallaght, are looking to employ a full time Florist Junior. No experience required, but must be interested and willing. 40 hour week, minimum wage with potential to earn overtime plus bonus. Busy Dublin 3 florist has a part time role available with flexible hours. The successful applicant will have experience in floristry and will be passionate about the trade, possess modern knowledge of current trends and will also have skills in design. Excellent customer service ability will be expected. Social media skills will be an advantage. Permanent full time/ part time positions are available in Annie Bloom Florist. We are looking for experienced, enthusiastic people to join our team. 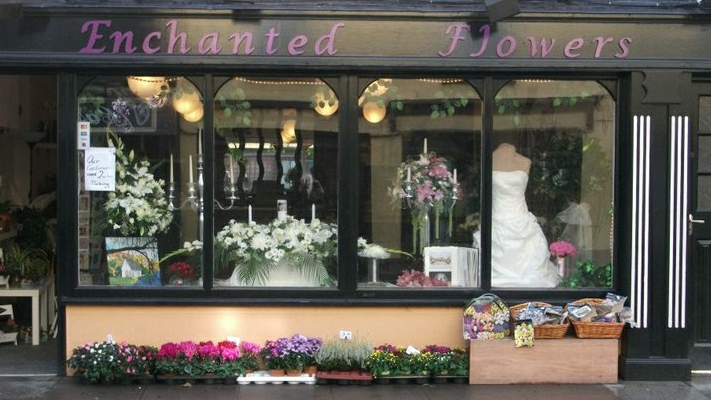 Caitriona from Cork opened her flower shop ‘Enchanted Flowers’ after completing our 4 Commercial Floristry Modules two years ago and is growing from strength to strength"
At Kay’s School of Floristry we can offer you advice and guidance on career choices within the Florist industry. There are various agencies that can also offer career guidance for all career paths and help you to make an informed decision. These agencies also offer some funding for training and education, depending on the personal circumstances of the applicant you may be entitled to help. It is a necessity during times of recession to develop your skills and education. It is an Employers’ Market and they are recruiting only the most highly skilled & qualified people. It is imperative that you consider your career path, opting for one that will lead you to employment or self-employment and one that will start you on your educational journey. You may be entitled to funding for our courses however each case is very individual and relative to circumstances. It is important that you contact the relevant body and apply for funding. If you wish to apply for funding contact our office (01 4538649 ) and we will issue you with a Quotation and documentation which you can bring to your appointment with Placement/Training Officers. They will probably give you a TESG form for you to return to the school to be filled in. The Education Finance Board - also has a range of grants and funding for individuals This website provides information on course fees and details on eligibility requirements for free fees. In addition, you will find out all you need to know about other sources of assistance for students, such as the Fund for Students with Disabilities, the Back to Education Allowance, the Student Assistance Fund and the Millennium Partnership Fund. You can find answers to possible questions you may have by accessing their Frequently Asked Questions (FAQs) section.